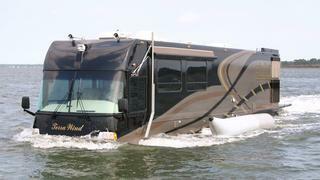 Would you swap your tender for an aquatic RV? 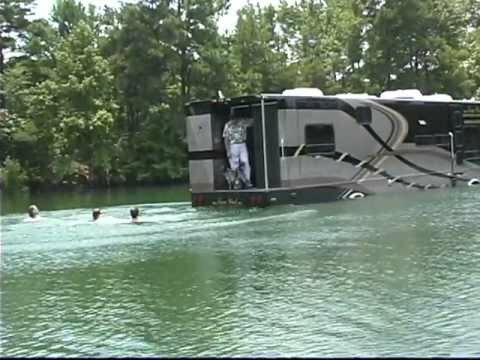 Tenders may have the luxury, jet skis the speed and amphibious cars the versatility but you would be willing to try an amphibious RV instead? While it may not be able to compete in the speed stakes, the Terra Wind by CAMI (Cool Amphibious Manufacturers International) doesn’t disappoint when it come to space, style and sheer usefulness. Capable of travelling up to 80mph on land and 7 knots at sea, the full-size motor coach features a leather dash modelled on an aircraft cockpit, complete with internet enabled docking system, GPS, maps and navigational charts – ideal for the captain who likes his gadgets. The luxurious interior is also completely bespoke and able to accommodate a range of floor plans, entertainment systems, floor coverings and furniture. Equal in size to a 49-passenger tour bus, the Terra Wind is large enough to fit a living area, kitchen, bathroom and sleeping area, making the RV a real home from home and thus a viable option for overnight stays away from your superyacht. As the video above demonstrates, the Terra Wind is largely targeted at families looking for a little more freedom and excitement on domestic holidays. However, if your superyacht regularly carries large charter groups or you are a particularly generous host, the practical advantages of having such a vessel to explore new areas both by sea and land are obvious. But with so many beautiful tender designs to choose from and the thrill of a jet ski to lure you away, could you really take the plunge? Visit camillc.com to find out more.